So…it’s been quite a while since I last posted…so many recipes to catch up on and post. Sadly, just thinking about all of those blogs makes my head spin. 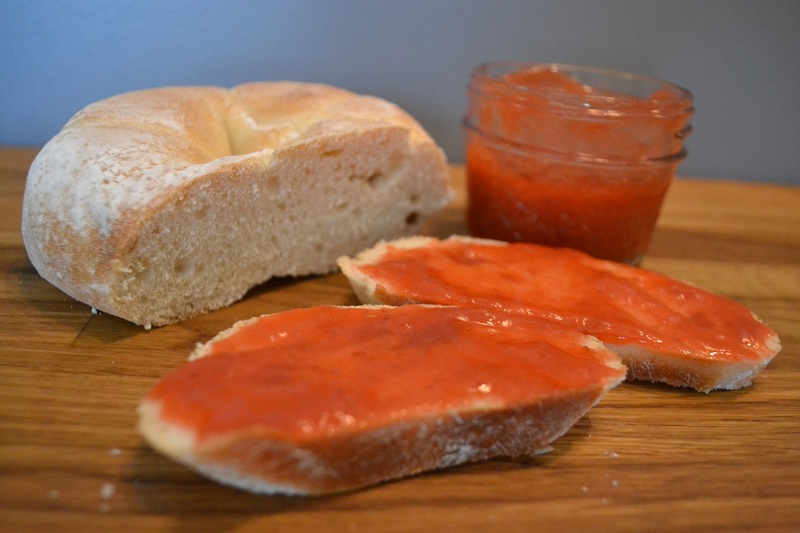 I have actually made the strawberry rhubarb jam twice…since I had to refresh my memory on how I made the jam the first time around…well and now a whole month has passed and we will see how much I actually remember about making it. 1. In a medium pan, combine the rhubarb, strawberries, water, and sugar. Heat at medium heat for about 2-3 minutes, until rhubarb starts to become softer. 2. Transfer jam mixture into a blender and evenly blend. Return blended mixture to pan. Add pectin and cook for about 5 minutes, stirring constantly. Meanwhile, heat jamming jars in hot water bath. 3. Pour hot jam into hot jamming jars, leaving about an inch at the top. Immediately close each jar and stand upside down to completely seal the jars. 4. Enjoy jam on bread. * Organic strawberries (store-bought) and rhubarb from the garden provide various healthy vitamins, including high fiber content, good source of potasium, vitamin A, C, and K, as well as folate. * Homemade jam has lower levels of sugar and less artificial ingredients. 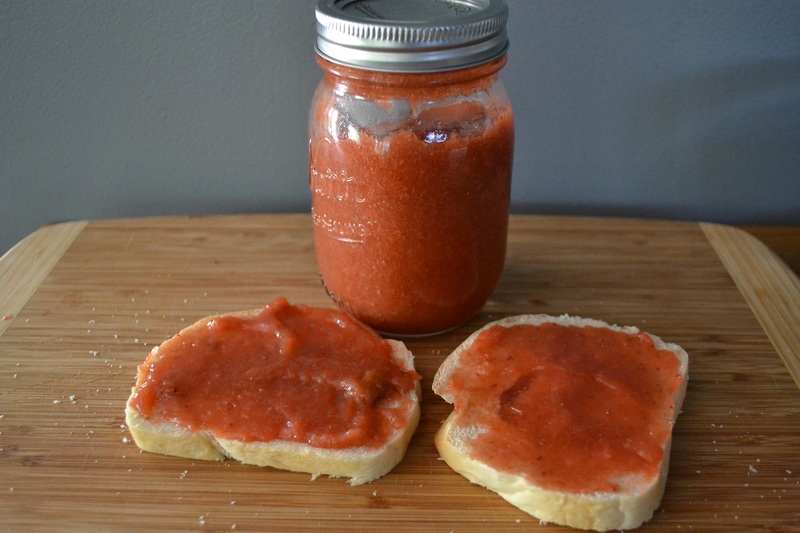 Categories: Appetizers & Snacks, Breakfast, In The Kitchen | Tags: jam, rhubarb, strawberries, SUMMER | Permalink. We have a giant rhubarb plant in our garden, so it was just a matter of time that I needed to try out a new recipe using rhubarb from the garden. 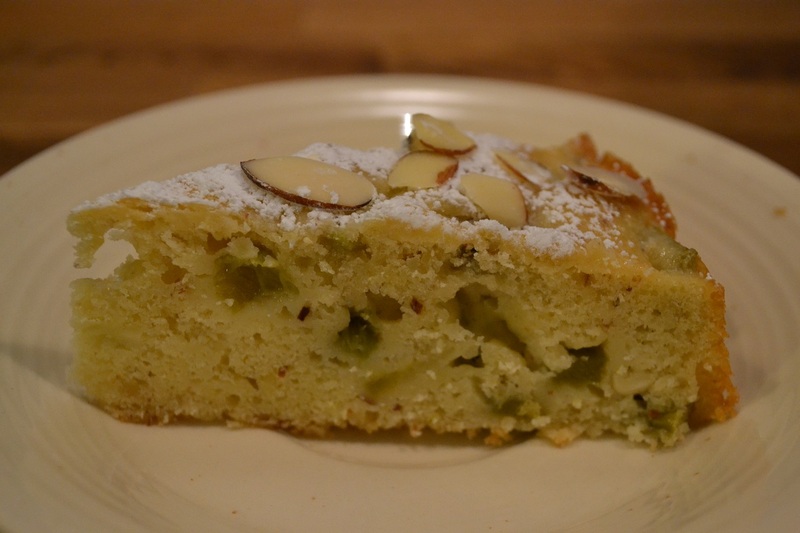 Growing up, my mom often made rhubarb compote and baked rhubarb cake. 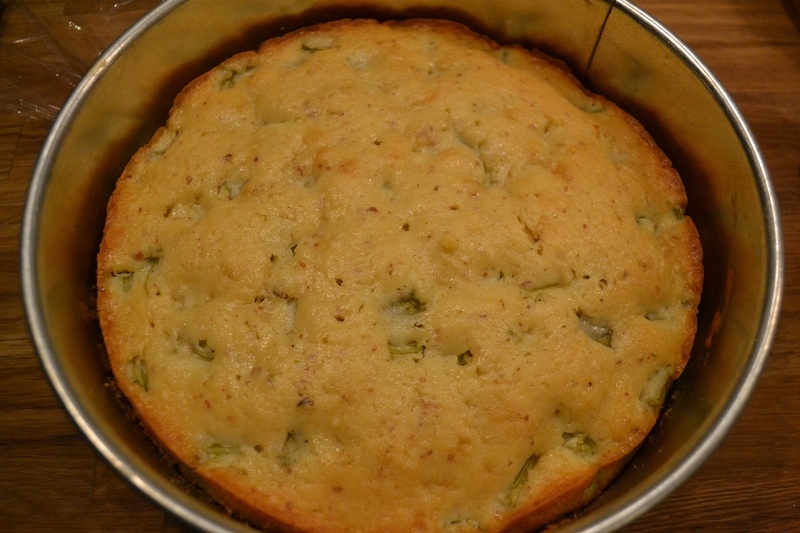 My memory of the cake is a bit cloudy, but I found a recipe that I modified a bit to bake rhubarb cake which is simply delicious. 1. Clean the rhubarb and peel the tough skin. Cut the rhubarb stalks into cubes (approximately 2-3 cm in length). 2. Combine the butter, sugar, and eggs. Add the vanilla extract and add the salt as well as backing powder. Add the flour. Add the quark and the chopped almonds. Lastly, add the rhubarb pieces. 3. Pour the batter in a greased spring form. Bake in preheated oven at 360 degrees for 25-30 minutes (or until wooden stick inserted comes out clean). 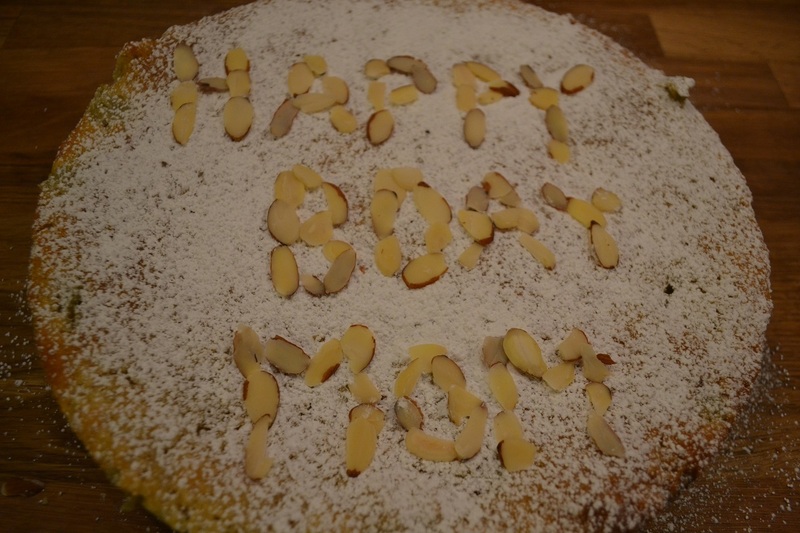 Once the cake is fully cooled, sprinkle with powdered sugar and sliced almonds. Note: Quark is a dairy product that you may be able to find at Whole Foods. Alternatively, you can try to substitute quark with plain organic yogurt. * Rhubarb stalks are naturally low in calories, while providing a lot of dietary fiber and anti-oxidants. * The stalks are also rich in several B-complex vitamins such as folates, riboflavin, niacin, vitamin B-6 (pyridoxine), thiamin, and pantothenic acid. * Rhubarb stalks also provide good amounts of vitamin K. Vitamin K promotes bone formation and strengthening. Adequate vitamin K levels help limit neuronal damage in the brain. * While I sometimes replace eggs with ground flax seed or egg substitute in recipes, eggs actually have great health benefits. They are rich in iron, vitamins B, A, and E, selenium, and zinc. In addition, they are a good source of protein. Therefore, eggs provide antiaxidant wualities that may help to protect against some forms of cancer. Futhermore, it is one of a few sources of vitamin B12, an essential vitamin for the nervous system, for vegetarians. 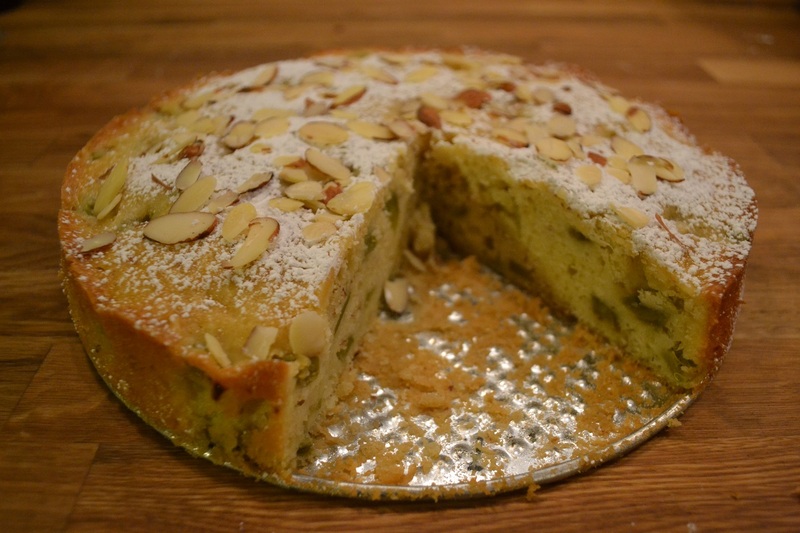 Categories: Cookies & Treats, In The Kitchen | Tags: almonds, cake, quark, rhubarb, SPRING, SUMMER | Permalink.